[By Nick] Hello everyone, Nick here. Due to uncontrollable circumstances, I had to fill in for Dubba on this week's episode of the Nosh Show. I know you're disappointed but give Episode 40 a listen anyway (MP3 here). Marvo, Ryan, Eric and I discuss if we'd nosh some new candy from Mars, talk about food crossovers and as then wrap up with last bites which include Red Bull's legal settlement. Leave me some feedback on what you thought of my job filling in. That said, Dubba will be back for the next episode so you'll soon be getting your usual fill of rants and funny sounds. 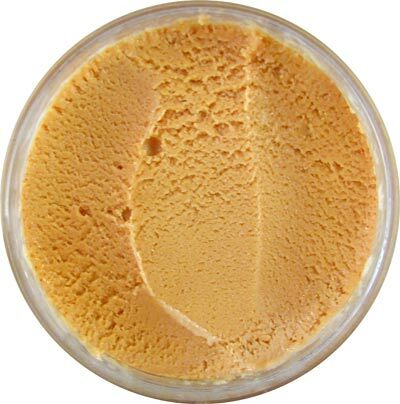 I mentioned that my Nosh of the Week was Ciao Bella Brown Sugar Caramel Gelato. It's a simple flavor but as I said, it tastes exactly like the coating of a caramel apple. 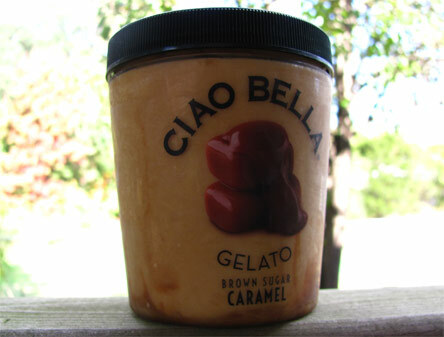 Ciao Bella is starting to rival Talenti and The Gelato Fiasco in terms of texture and this new flavor is no different. 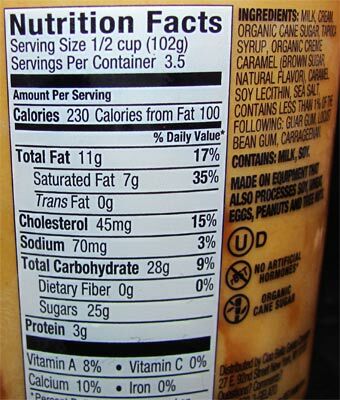 This flavor, or at least my pint, didn't come without any downfalls though. As you can see, the promised caramel swirl is missing for the most part. I was only able to find it as I made my way to the bottom and to be honest, it didn't really taste all that different from the base. I'm sure if it was more incorporated then my overall experience would've been better but the version I had warranted enough pleasure for a potential repurchase. Okay, that's all I've got, I hope you enjoyed the show and are having a wonderful Columbus day! Nick, I thought you did a great job on the show. It's fun to have a bit of diversity on there from time to time. But I do hope everything is ok with Dubba! Is there any way you can tell us where you are buying some of your ice creams (at least the ones not given to you by the company). Some of the brands you list sound wonderful, but I have great difficulty finding them locally. Danielle, thanks and don't worry, Dubba is alright and will be back to his grumpy, ranty self for the next episode! Anne, Ciao Bella did send me this but I have seen Ciao Bella carried in most higher-end stores in my area like Whole Foods and The Fresh Market. The problem with me listing where I get things is that I mainly shop at stores that are only located in New York or contained to the North East. I don't really go to national places too often since I don't have a wide-selection of them. So me saying I found something at Price Chopper would have little meaning to the majority of readers for the site. Hope that explains why at least I don't list where I get things.